In Mexico, the Southwestern US and restaurants who are savvy, you can get real tacos. The meats are traditionally grilled or slow cooked, the salsa and other toppings are really fresh and so are the tortillas. And when you’ve had a real one, you don’t ever want to go back to the kind made with ground beef and a packet of spice. So how do you get real tacos if you don’t happen to live near a purveyor of such delicious things? Well, you have to make your own and really it’s not that hard. 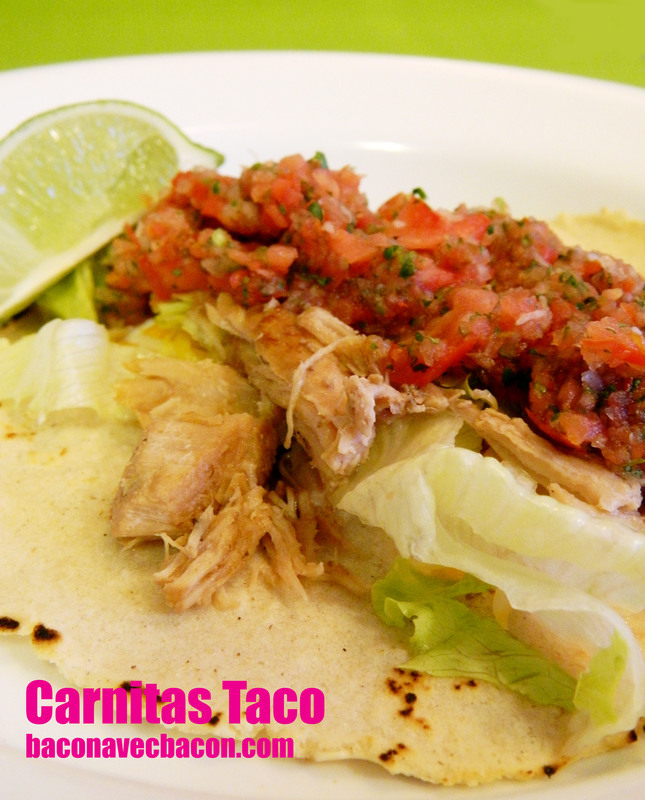 I like to make pork tacos which are known as carnitas. I also make my own tortillas and salsa. And I know what you’re thinking, “Wow, that sounds really hard.” Trust me, if it was, I wouldn’t do it. I’m too lazy for that! 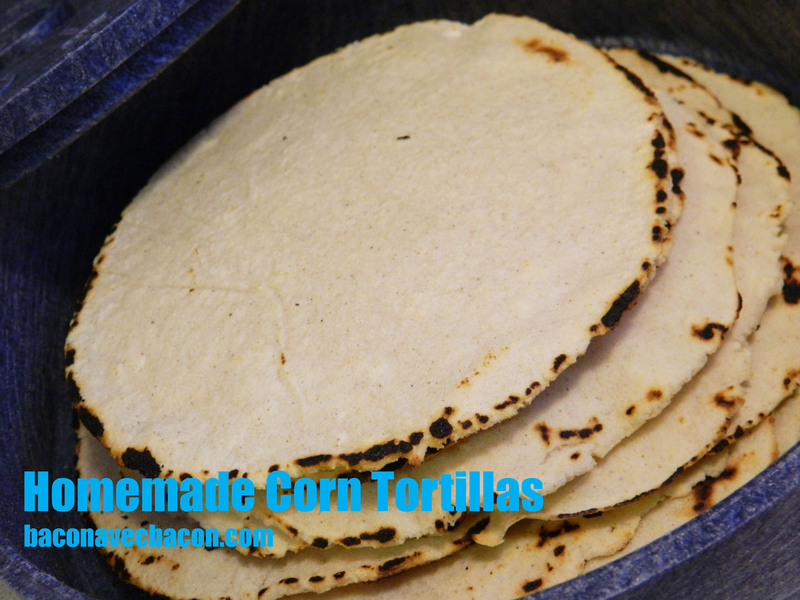 Putting all three recipes in one blog post would be a bit extreme, so check out my recipes for corn tortillas and salsa on different pages. Throw everything into a heavy bottomed pot and simmer on low until tender (about 2 hours). When ready to serve, add some pork and a generous ladle of drippings to a frying pan to crisp/caramelize the meat slightly. This will make enough pork to feed a huge crowd but it freezes really well for future enjoyment. Just make sure to add some of the drippings to each dish of pork you’re saving. Enjoy in fresh tortillas, with fresh salsa, lettuce, sour cream, cheese and a squeeze of fresh lime. ** You can use regular oregano but the Mexican kind has a slightly different flavour profile. I get mine at La Tiendita, a latin grocery store on Merivale Rd. near Carling. The entrance is actually in La Cabana restaurant. You can also buy fresh tortillas here if you want to wuss out on making your own. Mr. Bacon has been planting a garden for the past couple of years. It’s fantastic because it does cut down on the amount of produce we need to buy at the store. The downside is trying to figure out what to do with all of the bounty before it goes bad. If you’re like us and have a whack of roma, cherry or grape tomatoes to use up, you need to test this recipe out. I will swear on a pound of bacon that it’s better than Lone Star’s and theirs is damn good. In a food processor, add the onion and the diced jalapeno and whizz until the onion is at a fine dice stage. Toss in the cilantro (I just rip a handful off the bunch) and throw the tomatoes in on top. Pulse until you get the desired consistency but beware of over blending – you don’t want gazpacho. Transfer the mixture into a bowl and squeeze in the lime. Salt liberally and stir. 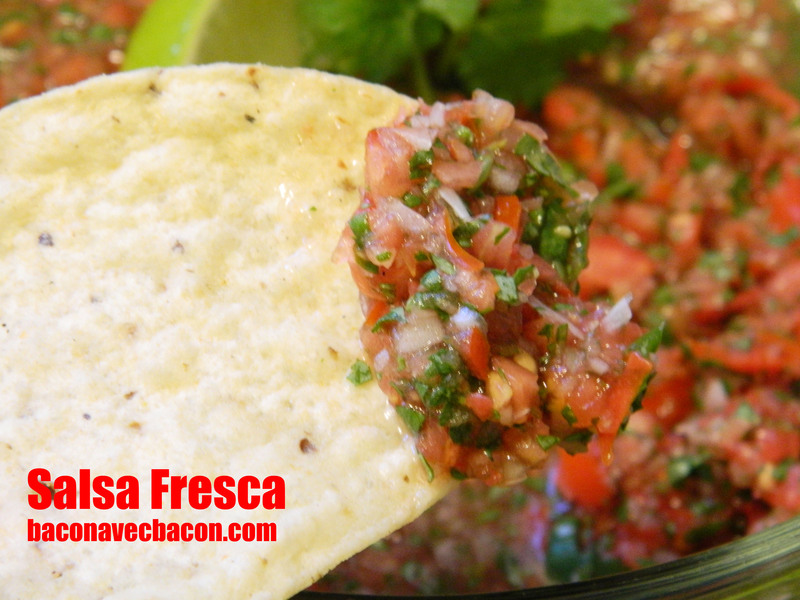 Let the salsa sit about 15 minutes for the flavour to marry. I’m not a huge fan of flour tortillas unless they’re being used for some sort of sandwich wrap. They don’t have a lot of flavour, and the ones in the grocery store are kind of like chewy cardboard. A few stores carry commercial corn tortillas now, but I find the texture on them a bit weird too. It might be because I’m spoiled by hot, fresh corn flour tortillas. They’re super easy to make and are WAAAY cheaper than store bought. For about $5, I pick up a bag of Maseca masa mix. It looks like this and is available at most large mainstream grocery stores. This bag will make multiple batches of about 10 tortillas vs. about $3.50 for 10 at the grocery store. Added bonus for celiac sufferers – they’re gluten/wheat free! You’ll also need a large ziplock freezer bag, a flat griddle or a crepe pan and a tortilla press which can be obtained at your friendly local Latin market, some speciality kitchenware stores or online for about $20. Follow the instructions on the bag of masa – it’s 2 cups of mix, a dash of salt and 1 1/8 (ish) cup of warm water. Add the salt to the masa and stir before slowly adding the water. Combine the water and masa with your hands and keep adding water until you have a playdough like consistency and the dough sticks together. Depending on how humid a day it is, you may need to add more or less water than last time. Take golfball sized pieces of dough and roll them into balls. When all your dough is rolled, cover the bowl with a damp tea towel to prevent them from drying out. Put your pan on just a little over medium heat. It’ll take some fiddling/testing to see what the perfect temperature on your stove/griddle is but you’ll get the hang of it quickly. 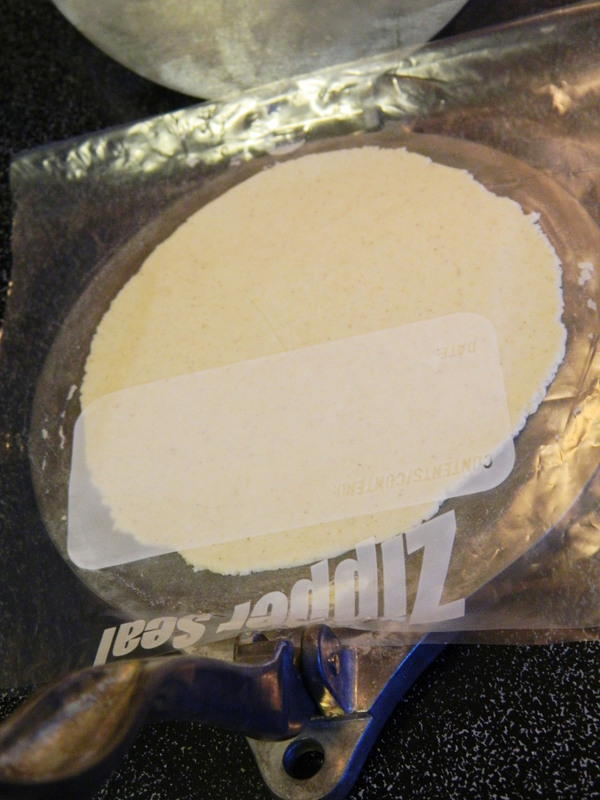 Take your freezer bag, and cut the zip portion and the sides off leaving the bottom of the bag so you have a rectangular piece of plastic with a fold in the middle that fits your tortilla press like this. Place the ball of dough in between the two sheets of plastic and squish it between the plates of the press, turning it once or twice to get an even press. Then pick up the plastic, open it and place the tortilla face down on your palm. Slowly peel away the plastic and then carefully flop the tortilla on to your hot griddle. Cook it for 30 seconds on one side, then flip. Cook for 30 seconds on that side and flip again. Cook on this side for about 1 minute. At this point the tortilla should puff up in the middle like a balloon. If it’s not, your grill might be too hot or too cold. If you’re not getting some browning, it’s too cold. If you’re getting singeing, it’s too hot. Don’t worry about getting a perfect ‘balloon’ each time. Even if they don’t get super fluffy, they’re still good. Keep the finished tortillas wrapped in a tea towel in a covered casserole, or in a tortilla warmer like this. I also use mine to keep pancakes warm when I have company! All in all, it should take you about 15 minutes to make a batch of tortillas. If you get a helper to warm up the pork, make the salsa and dice the veggies, you can have a fresh taco truck worthy dinner on the table in 20 minutes. Not too shabby! Even though it’s still summer, at this time of year I start looking forward to the great things about fall: cozy sweaters, falling leaves and hearty meals bubbling in a cast iron pot. 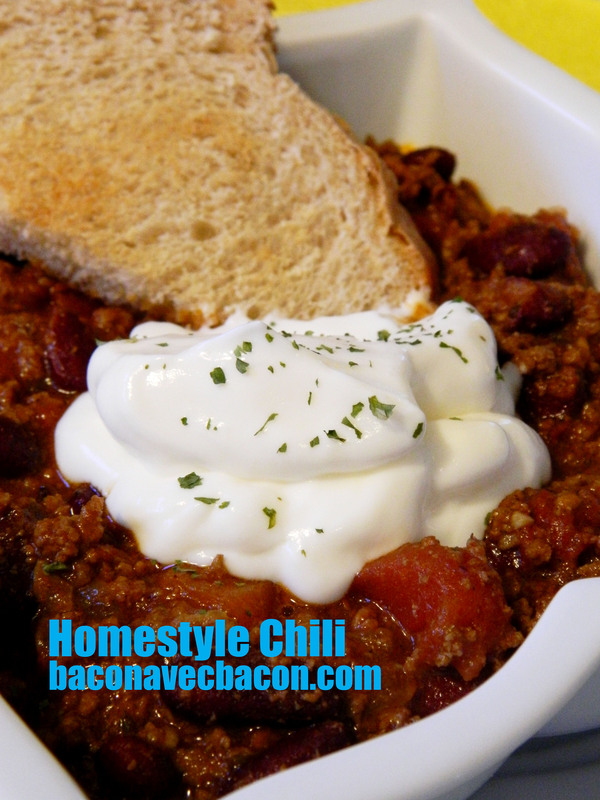 And when you’ve got 2 pounds of ground beef hanging around in the freezer looking to be used, it’s hard not to think of chili. Growing up, my parents had dueling chili recipes. Both had their merits but I think I have to give the upper hand to dad (sorry mom!) This one differs a bit from dad’s in that it’s missing a can of tinned sliced mushrooms (Mr. Bacon is not a fan) but it’s very similar. Enjoy it by itself or even better, on top of a hot dog. MMM. Get yourself a big heavy bottomed pot (like this cast iron one). On medium high heat, soften the onion and bell pepper with a couple of tablespoons of oil and some salt and pepper. The salt helps the water cook out of the vegetables. When the onions are almost translucent, add the garlic and cook for a minute or two until it gets fragrant. Add the ground beef and cook it until it’s brown. You might want to drain some of the oil off at this point, but if you use lean beef it may not be necessary. Throw in the spices, stir and cook for another minute or two to release the flavours. Then add the tomatoes, paste, and beans and stir being careful not to break up the beans too much. Throw in the bay leaf. Turn the heat down to low and let simmer for at least an hour but two or slightly more is preferable. Most of the way through, give it a taste and adjust the seasoning, including adding a tablespoon of sugar or so to balance the acidity of the tomatoes. Alternatively, you can brown everything in a frying pan and add the rest into a slow cooker to bubble away on low for about 8 hours. 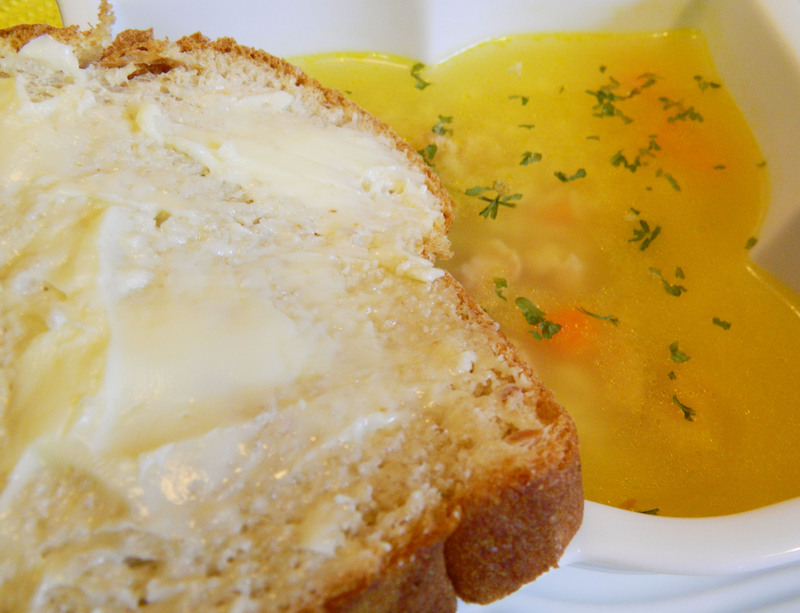 Top with some sour cream or shredded cheese (or both) and a side of crusty bread or toast. Reduces trips to the store – When you go to the grocery store for one thing, how many times do you come out with just one thing? Plus we live in the country so ‘popping out to the store’ isn’t a 5 minute trip. Saves money – Not running out to the grocery store every day will keep you from buying things you don’t need. By staying fully stocked at all times, you’ll also be able to pick up things only when they’re on sale. Trying new recipes – Having most ingredients on hand makes it easy to try to new dishes. Satisfying cravings – Have a sudden desire for fresh buttermilk biscuits? A stocked pantry can make that happen in 20 minutes. It’s not like I have some crazy ‘extreme couponing’ style warehouse of stuff either. I have a regular sized kitchen. I do use space saving ideas like keeping my spices on the side of my fridge using these magnetic tins. They just happen to be on sale at Canadian Tire this week. My one secret though, is that I did turn a coat closet into a pantry. It was right off of our kitchen and let’s face it, we’re bad at hanging up our coats anyway so it was a win-win situation. It cost just over $100 and a half a day of labour from Mr. Bacon and his dad. It’s by far the best home improvement we’ve done in our house. If you don’t have a coat closet, a shelving unit in the basement will do nicely as well. I think it’s the hint of saltyness with the sweet cookie and the chocolate but for me, it’s just because they’re the cookies my mom made when I was growing up. She said she’s never made another recipe after finding this one, and I haven’t either. Mix the flour, baking soda and salt and set aside. Cream the margarine until fluffy and beat in the sugar. Beat in the egg and the vanilla. Stir in the flour mixture, chocolate chips and nuts. 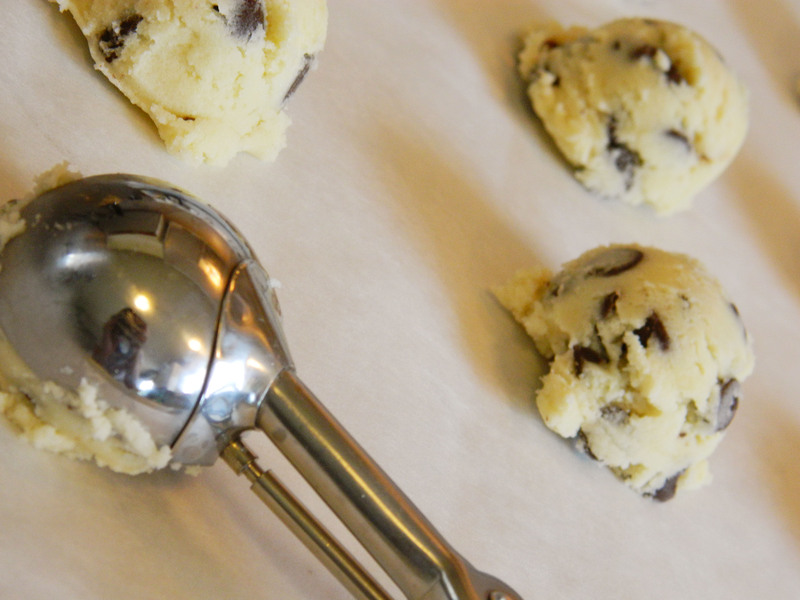 Use a medium cookie scoop to portion spoonfuls onto a cookie sheet covered in parchment. Bake @ 350 degrees for approximately 17 minutes or until golden. Don’t use butter for this recipe! Use hard margarine, in particular Imperial brand (the kind that comes in squares). It works best and yes they still taste lovely and buttery even with margarine. Ignore this rule at your peril. For perfect cookies every time, pick up some Air Bake cookie sheets. 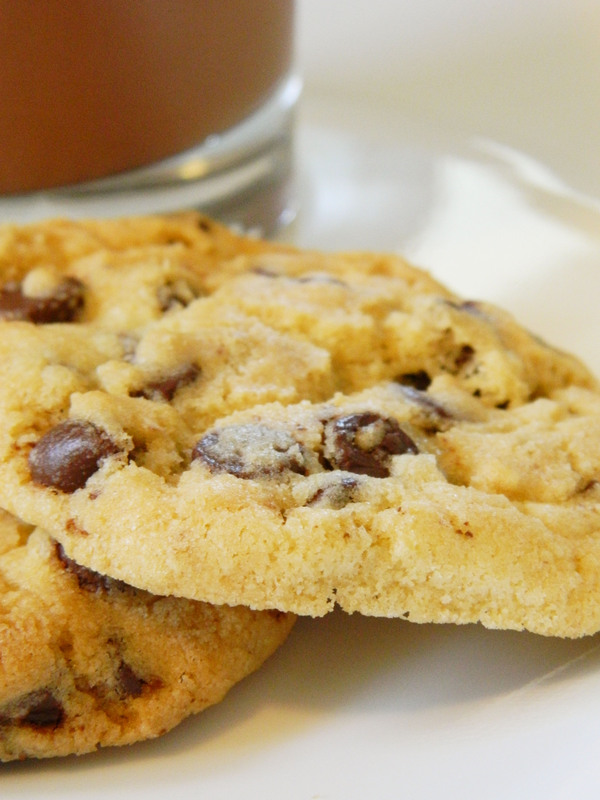 The double wall construction means that your cookies don’t get burnt on the bottom while the middle cooks. They’re worth the investment and are available at Home Sense, Bed Bath & Beyond and other nicer kitchen stores. Use parchment. They sell it at the dollar store and it means never scrubbing crud off of pans. You just pick the parchment up, wipe any crumbs off the pan and put it back in the cupboard. Earlier this year I set myself a goal of perfecting two cooking ‘staples’ that I was leery of attempting: pie crusts and yeast bread. I’m still working on getting the pie crust just right but thanks to this recipe from The Kosher Foodies, I’ve got the yeast bread thing down. 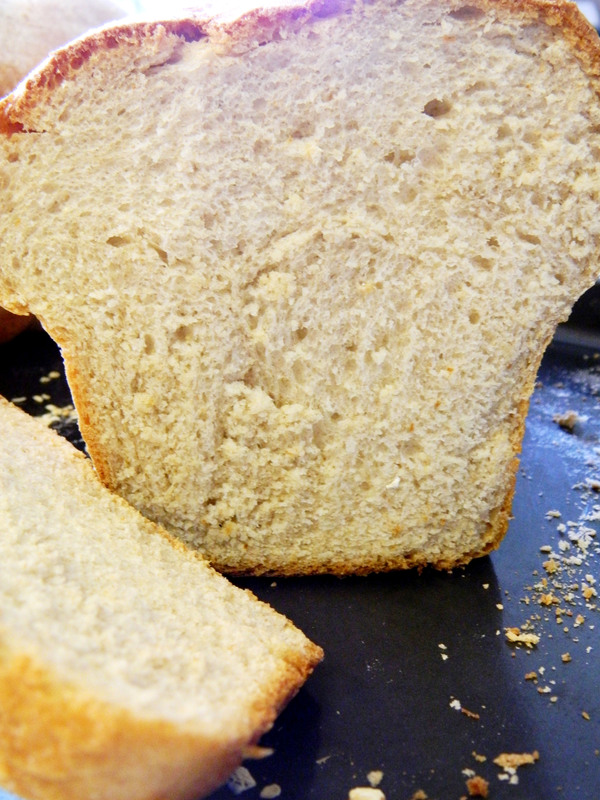 Since making it the first time, I’ve shared this recipe with dozens of people looking for an easy bread recipe and they’ve all raved about how great it’s turned out. 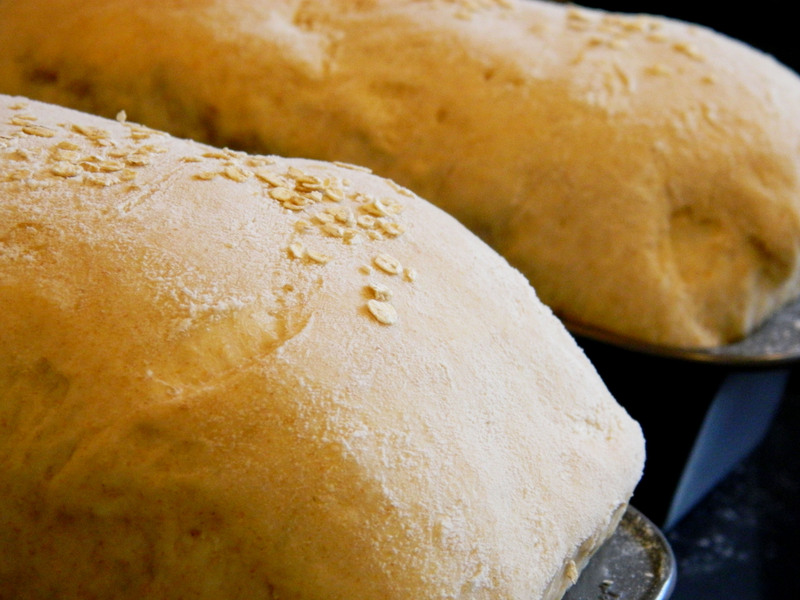 So do not fear amateur bread bakers – you can do it! In the bowl of a stand mixer, dissolve a teaspoon of the honey in the warm water. Sprinkle the yeast on top and let it sit for five minutes. You should be able to smell the yeast as it blooms and it should rise to the top and get fluffy. If it doesn’t, your water wasn’t the right temperature or your yeast is old. Put the dough hook on your mixer and start it on low. Add the salt, the oil and the rest of the honey. Add the flour, one cup at a time and knead the dough until smooth or about three minutes. You may want to boost the speed to medium towards the end but not before or you’ll wind up with flour all over your kitchen. Been there done that. When you’ve got a nice elastic ball of dough, spray the biggest bowl you’ve got with some Pam and throw the ball in the bottom. Spray it a little more on top. Find a clean tea towel and dampen it with water and drape it over the bowl. Turn your oven on just until the element gets red and then immediately turn it off. You now have a proofing box. Shove the covered bowl inside the oven and leave it there for about an hour or until the dough is doubled. When you come back, you’ll have a monster hunk of dough. Turn it out onto a floured surface, punch it down (seriously, just throw your fist into it a bunch of times) and kneed it by hand for a couple of minutes. Cut it into two pieces (using your handy dandy bench scraper), form it into a loaf and stick it into a greased and floured loaf pan. Set both pans (a few inches apart) on a cookie sheet, re-dampen your tea towel and put it on the cookie sheet next to your pans. It’ll provide moisture to your loaves while they proof a second time. Turn your ‘proofing box’ on again just till the element turns red and then put the whole cookie sheet for another half hour. When you come back, your bread should look like this. Remove the tea towel and bake for 30 minutes @350 degrees. If you store the loaves in an airtight container, they last an amazing amount of time for something with no preservatives – sometimes up to a week. They also freeze well. Use a digital meat thermometer to make sure your water is at 110 degrees. Get your yeast at Bulk Barn or another bulk store. It’s likely to be way cheaper than the packets or the jar. You can totally make bread without a stand mixer, you’ll just have to have stronger arms than I do. If you don’t have honey, sub for plain white sugar. MMM, delivery system for butter….